Villefranche-du-Perigord is a bastide town towards the south of the Dordogne department of Aquitaine, and to the south-east of Monpazier. An attractive if rather quiet little town Villefranche is however a pleasant place to pass an hour or two wandering the streets, which are more 'lived-in' than those of its famous neighbour at Monpazier. The central square in Villefranche-du-Perigord is lined on one side by 12th century arcades and on the other side is an attractive open market hall on stone columns. Tthe church here on the square is a much more recent addition, and only dates from the 19th century, so does not bear the fortifications that you expect of a church in a bastide town. Park in the square, then walk down the side street that runs off from the square, where you will also find a selection of local shops, and back along the road that runs parallel to the main road, and you have seen much of the town. En-route you will see lots of authentic medieval houses. Next to the tourist office there is a small museum dedicated to the chestnut and mushrooms that are harvested in the region. The principal attraction of Villefranche-du-Perigord is its location. The surrounding countryside is very attractive - mostly wooded hills and small sleepy villages such as Daglan, Besse and Prats-du-Perigord, and lovely to explore. 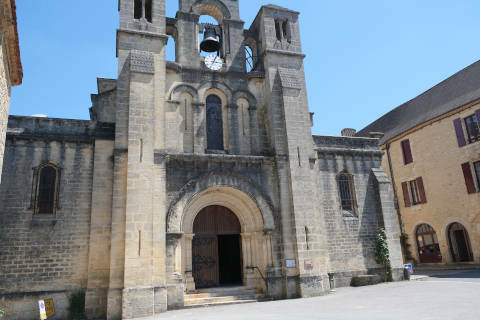 Among the highlights, Monpazier is perhaps the finest of all the villages in this part of France. You are likely to want to visit Chateau Bonaguil if you stay near here - one of the finest castles in France (in our opinion) while the castles at Biron and Gavaudun a little further west are also recommended - all three of these castles are in very scenic locations.